WNO’s rebranding exercise is an integral part of its overall strategy to make itself as fit as possible to face the many challenges of the current environment. This includes a reinvigorated artistic programme, a rigorously tight management of our financial outgoings, and a positive search for alternative funding. The branding exercise is far more than creating a new logo. It has resulted from detailed consultations within and outside the company on its mission and its identity, and has resulted in a renewed image that will serve for the next decade. Central to this is of a re-designed website, together with a new style of programme book to reflect the company’s themed seasons. Together these form an integrated strategy to support the company’s prosperity and creative energy over the coming seasons. One immediately obvious consequence of this rebranding is the demise of the very attractive and handy old programmes (such as the one for Tosca on the left), and their replacement by a much bigger season programme that covers in this case three different operas (Lulu, Madame Butterfly and The Cunning Little Vixen, bundled together incongruously under the theme of Free Spirits) . The new style programme is much heavier and larger so that it doesn’t fit in jacket pocket. It also means that if you just want to see one Opera in the season, and want to buy a programme for that one only, you can’t. Shades of the academic publishing industry. 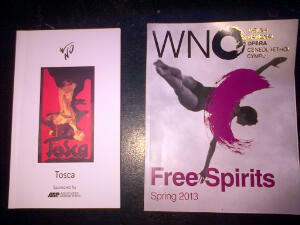 Any further visits of mine to WNO definitely won’t involve buying a programme.. 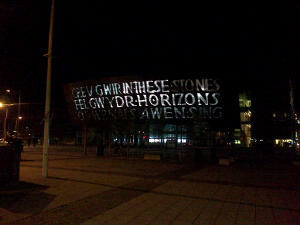 Anyway, one thing the marketing types can’t bugger up with their rebranding nonsense is the wonderful Wales Millennium Centre, snapped here as I went to get a bite to eat after last night’s performance.